That seems pretty straightforward. If you want to give away any perks, they have to be licensed Star Trek merchandise. You can’t give any patches or T-shirts or signed scripts or posters or anything related to your fan production in exchange for donations…at least if you want to make sure you aren’t sued or sent a cease and desist letter by CBS and Paramount. 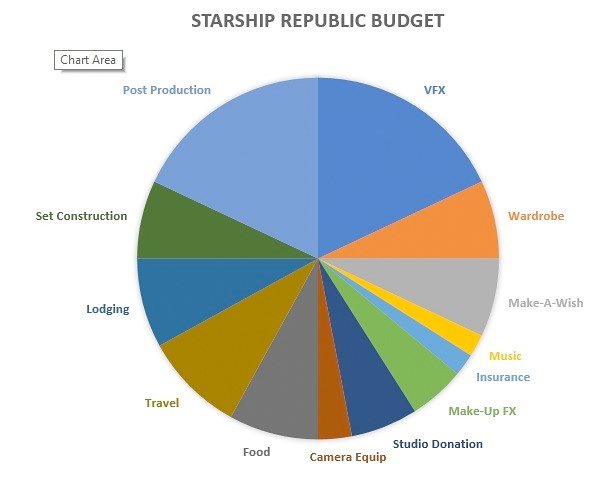 So how was it that STARSHIP REPUBLIC, the newest fan film to launch a crowd-funding campaign (and the first to do so since the Axanar settlement), was offering a whole set of perks? Sure, most perks were digital, but there were also physical posters in the mix (like the two images shown above). 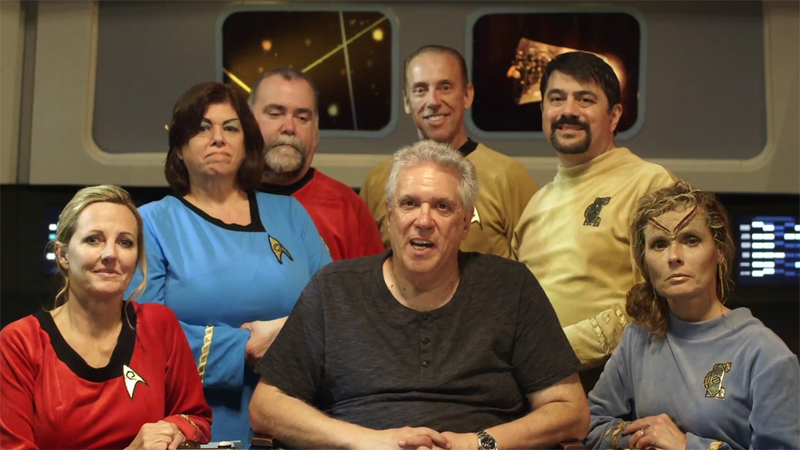 JONATHAN – Okay, we’ll get to all the standard “Who are you?” and “What made you decide to produce a Star Trek fan film?” questions in just a second. But right now, I wanna know just one thing: how is it that you’re giving away perks in your crowd-funding campaign????? RAY – Well Jonathan, I’d like to say that it was with much planning and forethought, but the horse was already out of the barn when it occurred to me to contact CBS. I and my team thought that if we offered physical perks with images of Republic and they were low ticket items, CBS would most likely look the other way. And that was how we initially approached it. But when we released our Indiegogo campaign, many of the folks that we had counted on to help us promote the campaign told me they felt that I had violated the perk guideline, and they were not going to move forward unless we took down or changed the physical perks we were offering. I tried using the argument that “the guidelines are guidelines and not rules,” but they weren’t having it. Without their help, I was dead in the water. At that point it thought if I were going to go down in flames, I might as well get it over with now. So almost out of desperation, I felt the best solution was to clear everything with CBS, if I could. JONATHAN – So you decided to contact CBS directly? What exactly did you do? RAY – Well, I spent about an hour internet trolling for John Van Citters’ e-mail address. I’m pretty persistent and, true to form, I found what looked to be a correct address. I composed an email to John not knowing if it would actually get to him…and if it did would he even read it…and if he read it, would he even reply? JONATHAN – Would you be willing to share the e-mail that you sent him? Forgive me for writing to you directly, but we have just launched a crowd funding campaign for our new fan film, Starship Republic. We had previously filmed a 6 minute vignette which is now online and are now looking for funding to complete 2 15-minute episodes. The campaign launched yesterday (Monday Feb 13) and has been met with some concern regarding, for the most part, our perks. We have followed the guidelines to the letter in all other respects and we feel that our perks, while not licensed, are modest and would not be an issue with CBS. All physical perks are are provided at low donation amounts. We are also donating 10% of all contributions to the Make-A-Wish Foundation in Southern Florida, an organization that I feel very strongly about for personal reasons. I most likely should have contacted you prior to launch as this is one of the first campaigns since the guidelines were released and the first since the Axanar settlement. I would appreciate if you could have someone look at our campaign and give us your comments. I have been a fan of Star Trek for all 50 years and am respectful of both the franchise and CBS’ ownership, and we have tried to carry that respect into our campaign. JONATHAN – And I’m guessing you got a response then? RAY – Well frankly, thinking I would be in limbo for days or maybe forever, I didn’t know what to expect. You know, hope for the best but expect the worst. But to my complete surprise, I received a positive reply from John within just a few hours! I was floored! JONATHAN – And what did he say? RAY – Well, I’m not sure whether I’m allowed to share his e-mail response to me verbatim, but he thanked us for reaching out to them and said they didn’t see any issues with our present campaign. JONATHAN – Not even the perks? RAY – He didn’t mention them. JONATHAN – Maybe he didn’t notice? RAY – Well, he did remind me that CBS reserves all of their rights and remedies if we end up violating the guidelines. JONATHAN – That doesn’t surprise me. RAY – But he did wish us the best of luck with our campaign. JONATHAN – Well, that sounds friendly. And I don’t say that sarcastically, as I actually think John Van Citters is a really nice guy. So you got the official stamp of approval to have perks… congratulations! RAY – Well, it’s not official approval. I actually thought it was, so I had posted that CBS had approved our Indiegogo campaign. Poor choice of words I guess, and I was getting some flack. This past Monday, John e-mailed me again stating that CBS does not approve fan film campaigns, and he asked me to immediately remove that notice from our campaign page. He said that, even though they don’t see any issues at present, that’s not the same as approval or any sort of implied endorsement. And it’s not a waiver of rights on the part of CBS. JONATHAN – And so you removed the notice, I take it? JONATHAN – Well, I suppose it was an honest mistake. I think all fan films are trying to navigate this “undiscovered country” that is the guidelines. And probably so is CBS! I’m sure misunderstandings are going pop up for a while still. In fact, it’s probably a good thing this misunderstanding happened, since it gave John a chance to clarify things. So, since John flagged your planned six episodes as a concern, does this mean we’ll only ever get to see 30 minutes of Starship Republic? RAY – I certainly hope not. The future is always unpredictable. My goal now is to make our full episode and live to fight another day. I have no intention of fighting the spirit of the guidelines and to remain respectful of the franchise, but I hope I can still work within its framework and tell some stand-alone stories with our crew. JONATHAN – So how did you come up with a budget of $16,000? I saw the nice pie chart, but I didn’t see specific amounts for any of the items, just percentages. RAY – I have some very skilled and educated members on my team. Gabriel Morgan is my cinematographer and post-production editor, and Samuel Cockings, whom you know from Trekyards, is doing our visual effects. We Skype all the time and put our collective heads together to determine all of the services we would need to accommodate, a real dollar amount to complete our episode, and approximate how to allocate those funds at least by percentage. The one hard commitment we have is that 10% of all contributions will be donated to the Make-A-Wish Foundation of Southern Florida, something the entire cast and crew is passionate about. $16,000 is a real number, not something we made up, and far less than the $50,000 that the CBS guidelines permits. 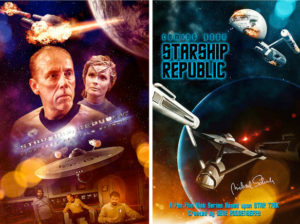 JONATHAN -There’s now a LOT of fan films and series that have shot on meticulously reconstructed TOS-era sets–Star Trek Continues, New Voyages, Starship Exeter, Starship Farragut, Starship Valiant, Starship Grissom, Dreadnought Dominion…to name but a few–what makes Starship Republic stand out as unique? 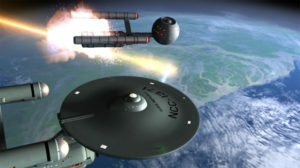 RAY – What makes us different from any other Trek TOS film is that it has been filmed in a modern style using modern film making techniques. 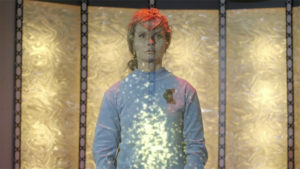 We are also the first fan film to cross into the Star Trek: Enterprise timeline and also bring in elements of TNG. 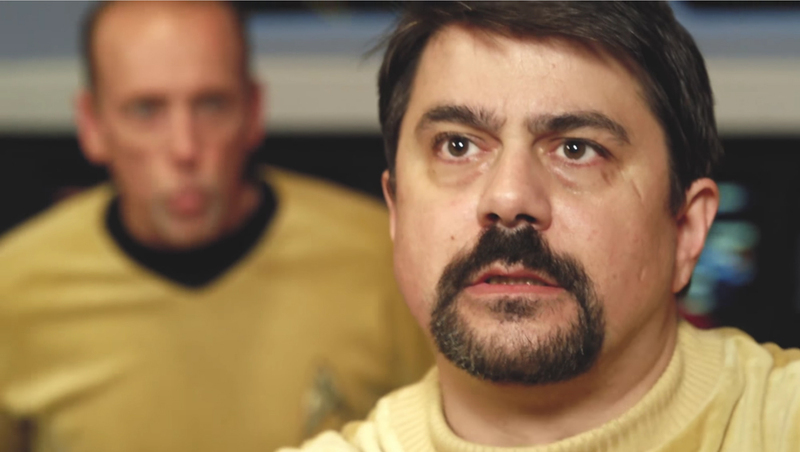 Our goal is to make good drama with compelling characters that just happens to be set in the Star Trek universe, and we have a lot of timelines to draw on. JONATHAN – What exactly do you mean by “a modern style using modern film making techniques”? RAY -While there have been many original series fan productions over the years, the most notable being Phase 2 and Continues, each was attempting to re-capture the 1960’s feel. An example of depth-of-field where the camera shifts focus between two actors in the same scene…where the one who is speaking is sharp while the other is blurred. And then it switches. We at Republic, however, are taking a different approach. While the look and feel of the original series has stayed the same, cinema and technology has developed. We saw how good the 1960’s styles can look when filmed in a more modern way in the Star Trek:Enterprise episode “In a Mirror Darkly.” We want to take this one step further and use high end Canon Cinema cameras utilizing depth-of-field, more creative angles, and both free-hand and slider-based shots. All of this combined will give our story a unique feel since, fundamentally, we want to make the best film possible that just happens to be in the TOS era which, in turn, will help give it all a modern feel. In terms of our visual effects, we have Samuel Cockings, the CG artist behind the popular web series Trekyards, taking on all of our VFX, both our space shots and other effects like the transporter effects. He has had over 2 years experience over at Trekyards working with Star Trek ships and he is again approaching these classic 1960’s designs in a more modern way. Rather than trying to replicate the feel of the 6-foot model Enterprise from the 1960’s with motion control and limited movements, he is trying to capture a feel closer to the USS Defiant we saw in “In a Mirror Darkly.” And he wants to push that even further with angles that you have not seen on Star Trek before but still keep that Trek feel. You will see what we mean when you watch the vignette and our new upcoming teasers. JONATHAN – Actually, I’ve already seen the vignette, “Serpent of Yesterday,” and the VFX are very impressive. Samuel definitely did an outstanding job. RAY – Thank you for saying so. Anyway, the bottom line is: we are not trying to replicate the original series; we are trying to tell a new and modern story that takes place in the original series timeline and using everything at our disposal to make it look as good as possible in its own right. JONATHAN – Okay, let’s switch gears to the “origin story.” Who are you and what made you decide to produce your own fan film? Next time, we learn more about how Starship Republic came to be, what’s in store for the future, and the trials and tribulations (not tribble-ations) of shooting your first-ever fan film and discovering at the last minute that half your cast didn’t bother to show up!!! What is a director to do? And remember you can DONATE by clicking here and you can keep up with the latest Starship Republic news on their Facebook page. Well you just force cbs out into the open to where they need to stop useing this. You should look at this website called writers guild of america west. Look at the rules they have. It is the same thing you are working with. Which rule(s) are you referring to, Kenny? Feel free to copy-paste them into a comment. Some typos are more…unfortunate…than others. So…what has changed in only a couple years where once John Van Citters couldn’t give any kind of reply or guidance to a fan film asking for input to now being somewhat cordial? For decades, the Star Trek license holders would not address any fan film officially because it implied a tacit approval that could/would be seen in a negative light by certain licensees. But fan films didn’t go away, and eventually they needed to be addressed–like having a growth that just keeps getting bigger. The guidelines effectively “broke the seal” of non-acknowledgement. Now not only has CBS acknowledged fan films, but they sorta have to provide them guidance because the guidelines are still unclear and potentially ambiguous/flexible in certain places and cases. To not provide guidance now could place CBS in a legally awkward position. As happened with Axanar, not saying anything clearly and specifically can lead to the potential of a finding of non-willful infringement. In other words, Alec Peters and the lawsuit provided lessons to both the fan filmmakers AND the studios. Well, for a guy that didn’t want to “micro-manage” amateurs projects, he just did that ! The lesson the studios should learn is that they have interest in working with amateurs willing to go beyond simple homemade stuff. It could be far easier to get profit from amateur works than creating a series for an obscure pay per view channel. And what other licensees would be offended by unrelated projects ? And you realize that not all lawyers work for free. The one(s) that Ray will have to hire will most likely bill at least $500/hour and want a $5,000 retainer. It’s easy to say “hey sometimes you gotta take risks” when it’s not you personally risking anything. Personally, I wouldn’t play a game of chicken with a publicly-traded, multi-billion dollar film studio that just spent a million dollars suing a Trekkie for pushing things too far. It could have saved the studios nearly a million dollars in legal fees, if nothing else. Totally legal to use, looks great, I did some for Yuri’s Night LA last year. From a point of view as a good friend of Ray nothing more. I am watching comments here like a hawk. Please even if you do not let this comment through be mindful that Ray is a good man and not to let people slate him. I think Ray is a great guy. I only just made his acquaintance (virtually and via phone) two weeks ago, but he’s been friendly, up-front, and very proactive and diligent about getting me information. He provided answers to both my first and then my second round questions in less than a day for each. I really hope more people will donate to his film. Republic is 7% of the way to their goal, which is a good start. But let’s help get them the other 93% of the way there. I donated $45 myself. Anyone wanna match me? If not, how about $25 or even just $10? Every little bit helps. 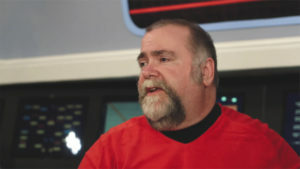 Rack-focusing and shallow DOF (depth-of-field) hardly qualify as modern techniques and have been done in other fanfilms. Previous Previous post: FAN FILM GUIDELINES: Reality Check (Part 1) – DO WE FIGHT ON? Next Next post: STAR TREK CONTINUES announces PREMIERE DATE and TITLE for their EIGHTH episode!